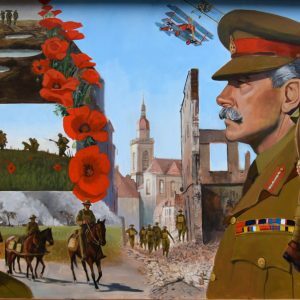 This mural depicts the heroism and sacrifice in World War I, the “Great War”. It speaks to the suffering of ordinary men in the trenches and elsewhere. The artist’s son and a friend posed in rented uniforms to depict the soldier at right, carrying his wounded officer. The huge gun behind them symbolizes the artillery that pulverized the landscape and transformed it into a quagmire. The Victoria Cross is for the bravery of all men involved, not just for those who received the medals. Sir Douglas Haig, Commander of the British Expeditionary Force, 1915-1919, is shown rising from the ruins of a town at centre. At left is the waste mud of no-mans land at Passchendaele and the wounded men who endured the terrible conditions. In the sky, Manfred von Richtofen, the “Red Baron”, pilots his red Fokker triplane in an aerial battle with Canadian Captain Arthur “Roy” Brown in his Sopwith Camel.